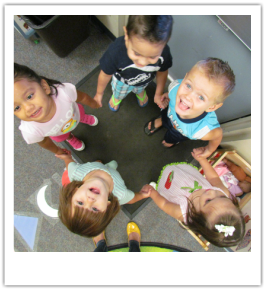 At the beginning of each week, a "Letter of the Week" is introduced and explored during circle time. For the remainder of the week, we immerse ourselves in all things relative to that letter! Our favorite activities include: Rainbow Writing the Letters, "What's in the Box?" Letter Sorting Game, ZooPhonics, ABC Cookie Cutters, Wooden Letter Sticks (from Handwriting Without Tears), Letter Word Posters, Tracing Letters for Letter Books, (from Handwriting Without Tears) Forming Letters with Playdoh, Shaving Cream, and Salt Trays, and charting the number of letters found in all the names in our class. Please note your child may NOT have participated in an activity listed below. ​Ms. Amanda changes the lesson every year so children who are enrolled in the program for more than one academic year are able to get a different experience. The activities below are some that are in our "rotation." On A week we will either craft alligators that look like the letter A OR decorate a letter A with ant ink fingerprints (depending on the class year). For snack we like to make 'airplanes' with celery, nut butter, and graham crackers! A reading of song/story "The Ants Go Marching" is also introduced and displayed in the reading center. For B week we sing the song, "Baby Bumblebee," and make Black Bean Baby Bumblebees with the black beans from our sensory bin. (Depending on the class year,) we will make lovely sun-catcher butterflies in the shape of a B using contact and tissue papers OR make B shaped bunnies with cotton balls. We will have a butterfly trail mix snack: a Ziploc filled with leftover treats and gathered in the middle with a clothes pin. (Depending on the class year,) it will either be cars on a curved road (multi-step instructions lesson) made their debut as the craft for C Day, cute caterpillars (color/patterning lesson), cotton balls, or clouds (made with home made puffy paint). The story "Have You Seen My Cat," serves as the daily read aloud. Our C themed snack is the most delicious part of the day; kids decorate chocolate C shaped cookies with chocolate spread and chocolate chips or snacked on crackers, carrots, and cauliflower! YUM! Children are not impressed when they are told that a D week snack is going to be dirt! However, once they are served up pudding, graham crackers, and gummy worms they are more excited than grossed out! Our D week craft depending on the class year will either consist of a tongue-twister of an art activity: Dotted Dog Houses with Doggy Doors and a Dog Inside, be letter Ds decorated as donughts, or D is for Dots! The children also enjoy a reading of "Dinosaurs. Dinosaurs," during story time. Following a reading of "Green Eggs and Ham," the children may be invited to make their own green eggs and ham for snack! Students crack their eggs, added shredded ham and cheese, and whisk in a drop of green food coloring; it is a first time experience for many of the little ones! Our letter craft for the day is a hit as well; students either collage an E with eye cutouts and letter Ee cutouts, make E shaped elephants with a salt/glue technique to add details, or design an E with various sized envelopes filled with pictures of E words. On F Day, students make an F is for feathers artwork, scrunch aluminum foil into the shape of an F, or they may look at pictures of flags around the world, then design their own flags in the shape of an F. The daily snack doubles as an arithmetic lesson. Children are served goldfish cheddar crackers on a "fish bowl" placemat. Story problems for addition and subtraction are provided verbally and children "ate" or "caught" fish to act the stories out. Following snack, children attended to a reading of "Fish," and "Rainbow Fish." For the art project, students either create gardens by trimming grass from the playground and cutting out flowers, engage in science for their letter G craft- making predictions and observations while mixing yellow and blue to make the color green, or create G shaped fish bowls filled with goldfish.! Following a reading of "In the Tall, Tall Grass," kiddos either work on fine motor skills, slicing green grapes for snack to make graham cracker, honey, and grape sandwiches, or eat gardens made up of bagel halves, avocado spread, and sprouts. H Week often falls perfectly on the day prior to Valentine's weekend, and the day is appropriately filled with hearts! Otherwise we use our handprints to make letter H art, construct H shaped houses (to correspond with a community unit), or fill H templates with happy faces (as an extension of our Mat Man/body unit lessons). Kids may snack on hamburgers, and read "House in the Night," and the shape of the month book, "Hearts." An ice cube sensory bin is a fun attraction on I Week, as is an ice cream buffet offered at snack time! Our reading segways to a craft centered on introducing the children to a new animal name- Iguana. After, "I Wanna Iguana," the students color and cut their own pet paper iguanas. In other years, children make I collages with insects pictures or with insects made form their fingerprints, or kiddos use paper "ice cubes" to build I shaped igloos with icicles. On J Day we read the big book version of, "Jamberry," and love to feast on a 'Jelly Bar' consisting of four uncommon flavors of jam/preserves and a small variety of breads. We wrapped the day up with making and assembling our own Jigsaw J puzzle art, decorating Js with jewels or designing jackets with cloth and buttons for letter Js to wear. On K day students will either construct kites out of contact and tissue paper with letter K's lining the strings, create a K decorated with kisses, make K kings, or K karate kids, depending on the class year. "Koala Lou" is read during daily story time, and students have a simple Kix cereal snack. The day finished with making letter Ks out of clay. This busy teacher is still working on finalizing this page!